I’ve been really tired lately. Baby J has not been sleeping well at night so we are up several times a night with him and then I get up in the morning and go to work with my elementary school aged special education students. I’m not sure which is more tiring; being up several times at night or my students when they are having a bad day. When I get home the last thing I want to think about is dinner. I know this is a big change from previous years but I just want a tasty meal that doesn’t require much work. Sheet pan suppers are one of my new favorites. I can put a protein and veggies on a sheet pan, season them, and put them in the oven and in 30 or 40 minutes dinner is ready and we only have one pan to clean. 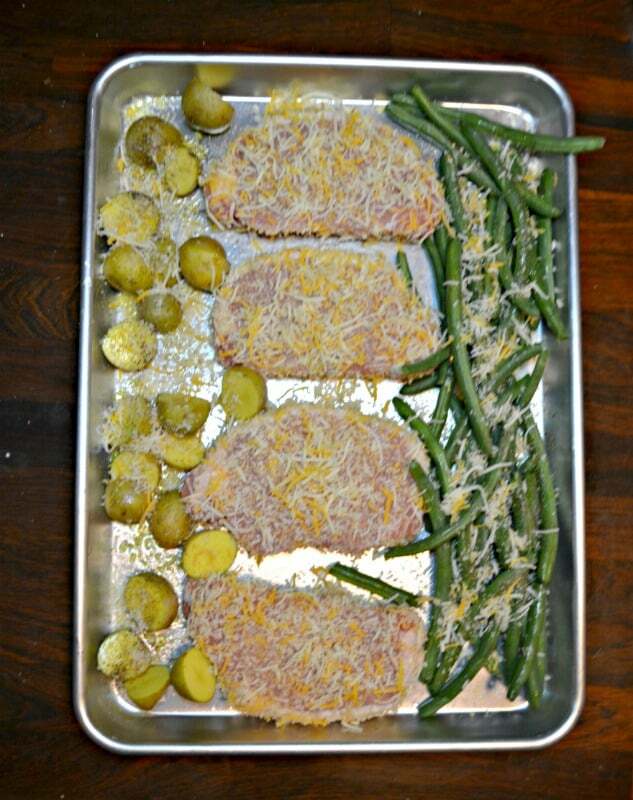 I’ve been trying a variety of combinations when it comes to sheet pan suppers. Most have a protein, potatoes, and then some type of roasted vegetable. The seasonings change based on what is on the sheet pan. 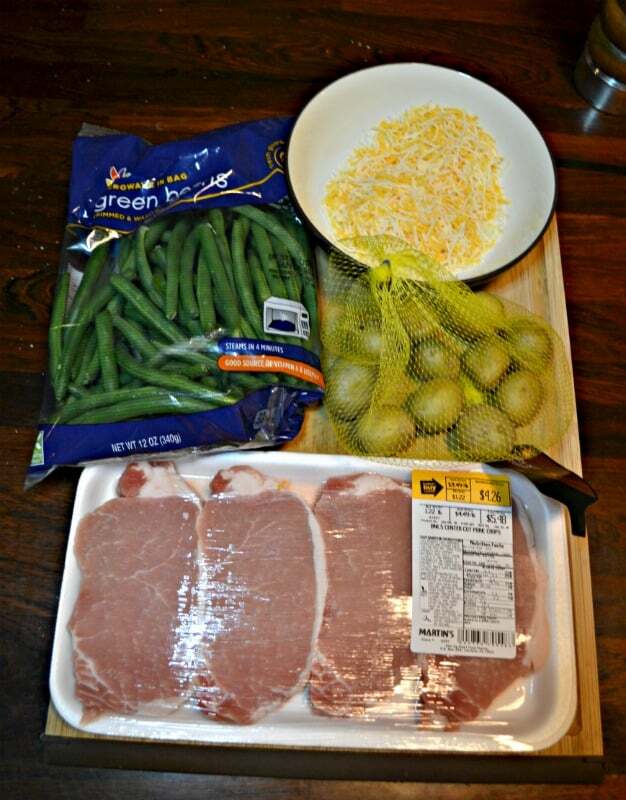 This version has pork chops, potatoes, and green beans. You could use any vegetable in place of the beans but that’s what I had in the refrigerator so that’s what I used. Other good options would be Brussels Sprouts, broccoli, or peppers. 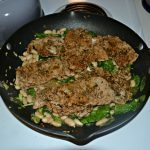 I tossed the pork chops with a combination of breadcrumbs, cheddar cheese, and Parmesan cheese then tossed the veggies with olive oil, garlic, salt, and pepper. It took about 10 minutes of prep time and then everything went in the oven. I had to flip the pork chops once but otherwise this is a hands off dinner. The pork chops were really good. They were juicy and flavorful. 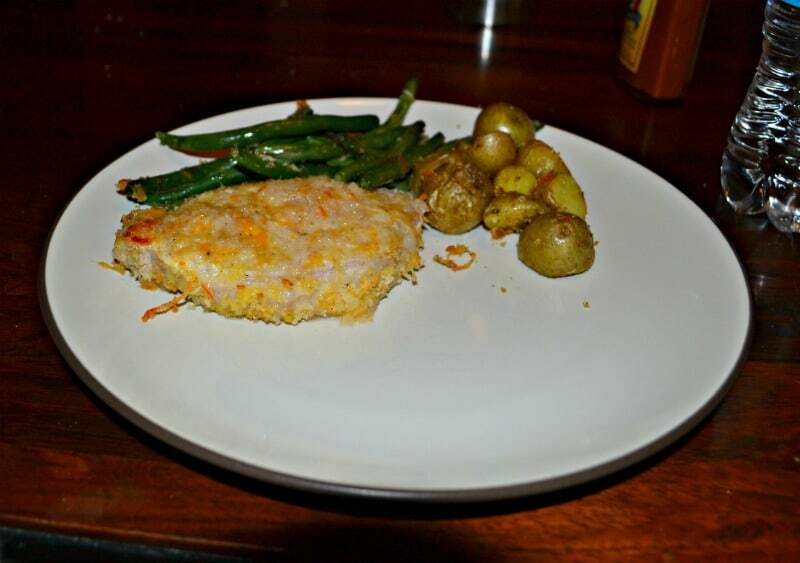 The potatoes were soft on the interior but crisp on the edges and the green beans were perfectly roasted. Everything was seasoned nicely and it made a delicious dinner. 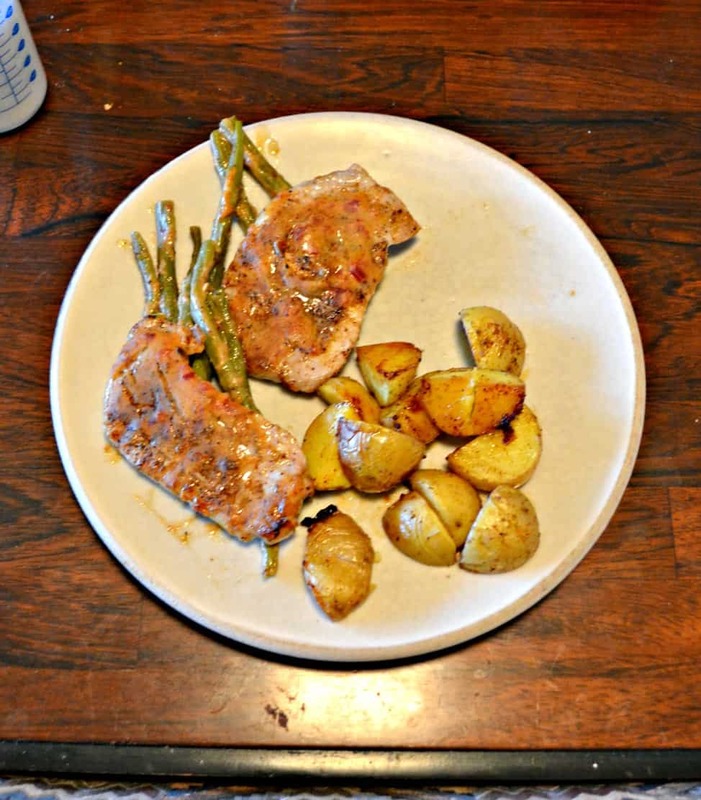 It only takes one pan to make this delicious Parmesan Pork Chops and Veggies recipe! In a shallow bowl beat the eggs. In another shallow bowl combine the Panko, cheddar cheese, Parmesan cheese, and garlic powder. 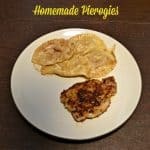 Sprinkle the pork chops with salt and pepper and then dip each pork chops into the eggs and then into the cheese mixture. Place in the center of the baking sheet. 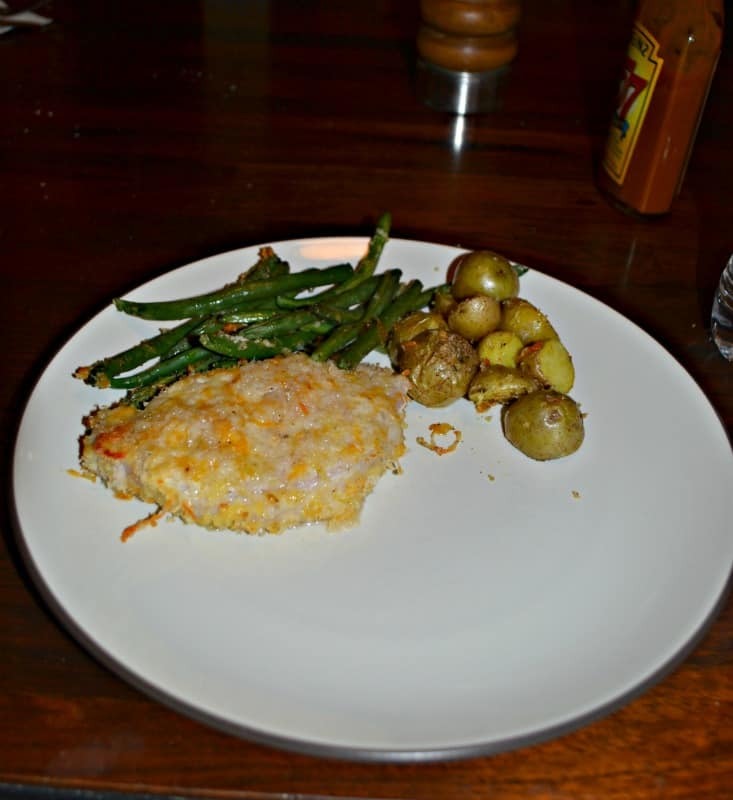 In a large bowl toss the potatoes, green beans, salt, pepper, garlic cloves, and olive oil. Pour on either side of the pork chops. Sprinkle the vegetables with the remaining breadcrumbs and cheese mixture. Bake for 20 minutes. 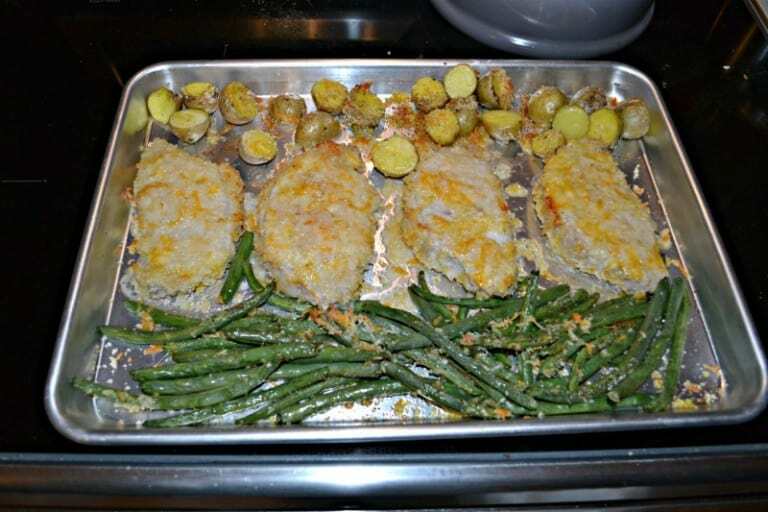 Flip the pork chops over and stire the vegetables. Cook for an additional 20 minutes.